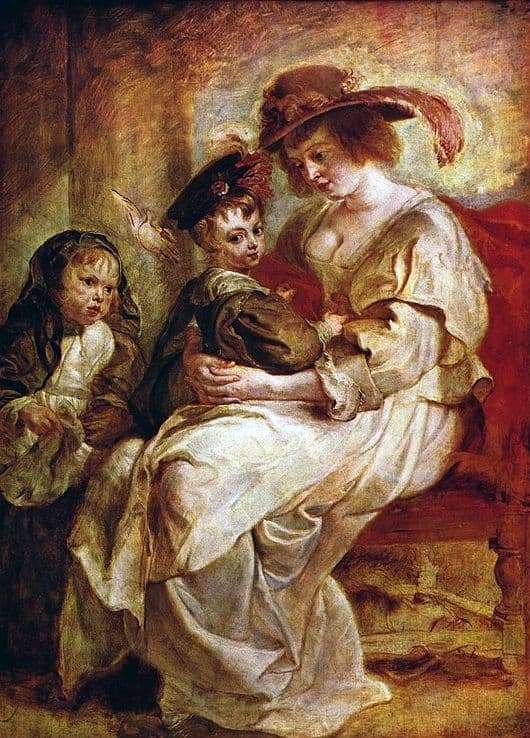 Rubens, one of the brightest representatives of Flemish painting, who, in addition, represents Baroque, is known not only for his paintings on religious and mythological themes, but also for his magnificent portraits. This work of art is made in oil on wood, from which the picture looks especially natural and picturesque. The artist depicts a portrait of his second wife, who ended up being his last true love, even though she was his first wife’s niece. As the saying goes, “love all ages are submissive”, thus, the difference between them was 37 years. The whole portrait is filled with high feelings, such as unbridled happiness, which is associated with a certain amount of excitement and responsibility, which is associated with the happiness of motherhood. From the faces and images, the portrait shows their spontaneity, ease and relaxation. Thus, the picture is full of naturalness and vital energy. But, despite all the quality of the work and its aesthetics, any attentive viewer can easily notice that the picture is not finished, because it has several features that are not peculiar to the author. This is evidenced by the third hand, which, most likely, should belong to the third child, but for some unknown reason, the work was not finished. Smears are very measured, despite the wide technique of writing, thanks to this there is no clear contour, and clarity is achieved through the game of glare, light and shadow. At the same time, and some unfinished painting does not interfere with its overall perception, thanks to what is known for equipment master, which combines the uniqueness and quality of execution, which distinguishes a picture of the artist, of all similar works that one way or another, still can not compete with the works of the great master.